From the outside, Shanghai 1930‘s appearance can be a bit deceiving. However, once you enter its doors you’ll find that it has a lovely contemporary yet traditional aesthetic. Shanghai 1930 offers traditional Chinese cuisine, with Shanghai influences on the menu as well. Their menu has a variety of dumplings to choose from, and many chicken, beef, seafood and vegetarian options as well. Their Crispy Noodles with Beef was actually quite tasty with tender beef. 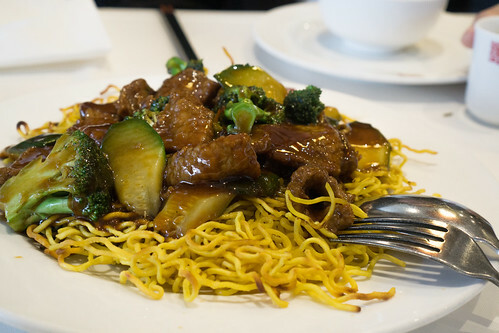 The sauce that it comes with, however, is quite strong, and leans on the salty side but nonetheless the combination of crispy noodles and beef and vegetables, is a winning combination. Shanghai 1930 offer what they call “Grandma’s Secret Fried Rice”, and it’s apparent that it isn’t your typical fried rice. 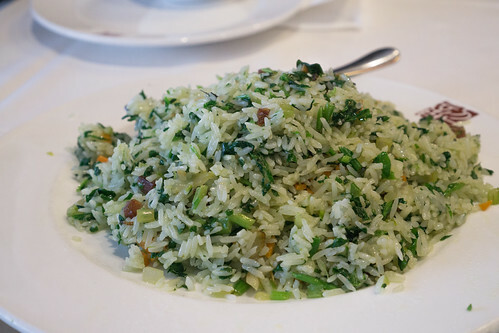 The use of chives and I believe spinach adds to the flavour of the fried rice, and it’s cooked with the traditionally used Chinese sausage. 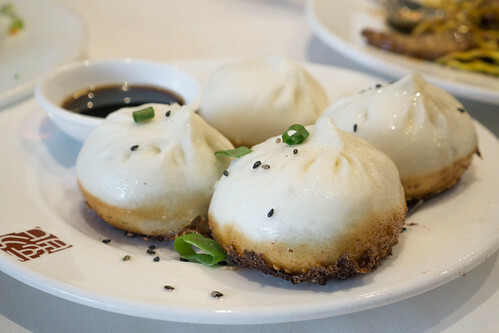 If you ever walk past this restaurant, you may notice the image of these dumplings. These are the Steamed Shanghai Dumplings that are fried on the bottom with sesame seeds. The pastry (or dough) reminds me of the dough used in Pork Buns, but a bit thinner. The crispy bottom with the traditional pork and ginger filling is an amazingly tasty combination and I’m so glad I tried it. Their soups you can order as one serve or for sharing. 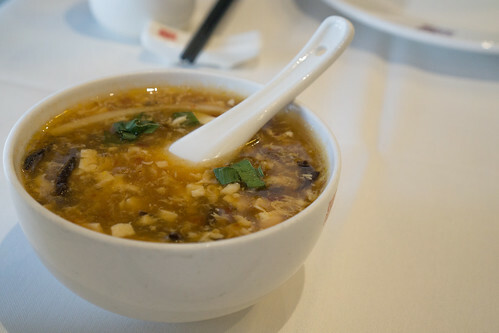 The Hot & Sour soup is what you’d expect, and has that lovely balance of heat and sourness, and just enough sweetness that nothing overwhelms the other. Yum. While, Shanghai 1930 may not be one of the “cheap eats” in Box Hill, it certainly makes up for it with its delicious dishes on offer. CJ Lunchbar situated on the corner of Little Lonsdale St and Hardware St is a popular little eat out for those wanting a taste of Korea. 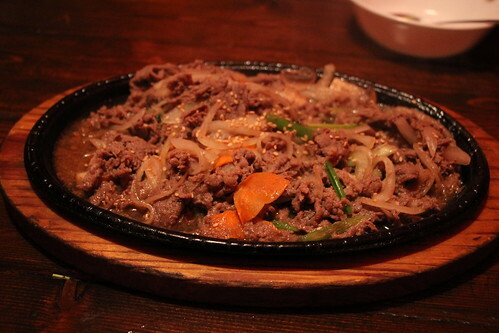 CJ Lunchbar doesn’t just open for lunch like its name suggests, so you can get your Korean fix for dinner as well. 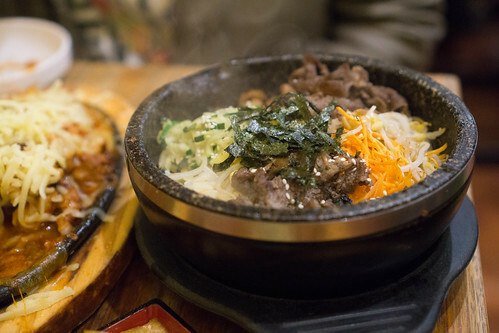 What’s great about this place is that the food is good, very good and the servings are generous and value for money and their menu offers bento boxes, rice dishes, and a wide selection of hotplate and soup dishes to choose from. Their Stonepot Bibimbap has all the ingredients for a tasty Bibimbap but it doesn’t come with the chilli paste that you’d often find provided with other Korean restaurants. Sometimes you find that the Bibimbap can be very bland, but fortunately this isn’t the case here. 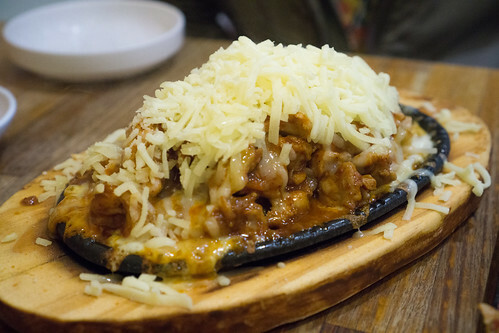 One of their popular items is the Cheese Chicken Bulgogi, one night I saw like the majority of tables order it. It’s a little bit spicy, but the combination of melted cheese and marinated chicken on a hotplate is one of the best dishes you’d find around. So good. CJ Lunchbar won’t win awards for being a relaxing dining experience, the tables are small and service is so-so but the food here is worth it. 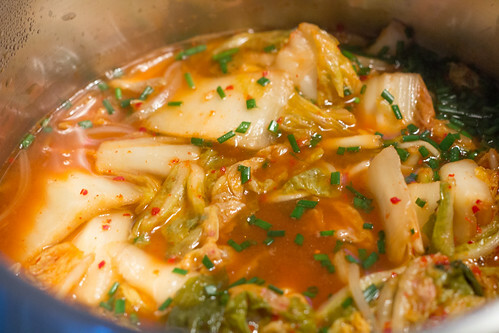 Making this soup from the Korean Fermented Hot Pepper Paste was one of my first experimentations in making a soup. With very few recipes out there, I was left to my own devices but have slowly refined the recipe to what it is now. 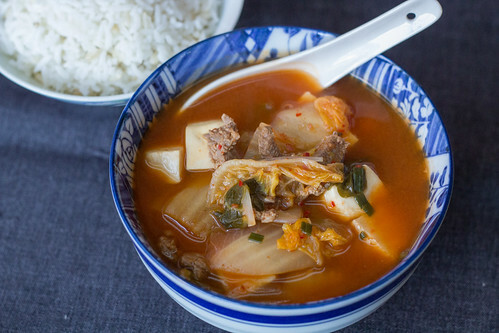 What I love about this soup is there are a couple of ingredients that can drastically change the taste, so you could have a Kimchi soup, a bold Beef flavoured soup, or even a Seafood soup. Because of it’s interchangeability, I do enjoy making it, just thinking what I could add to make it different from the last time. So here’s my tried, and tested recipe below! 1. 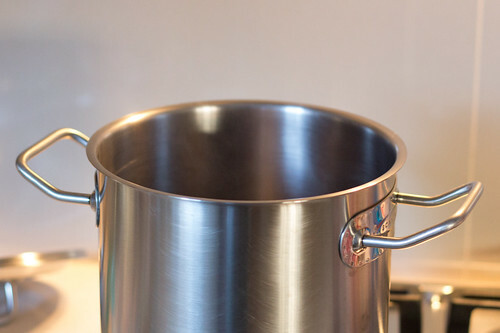 Pour the beef stock and water into a large/high saucepan or pot and bring to boil on medium to high heat. 2. Add in the pepper paste and stir in until all the paste has dissolved into the liquid. 3. Add in the shallots, salt and sugar and stir until sugar and salt have dissolved. 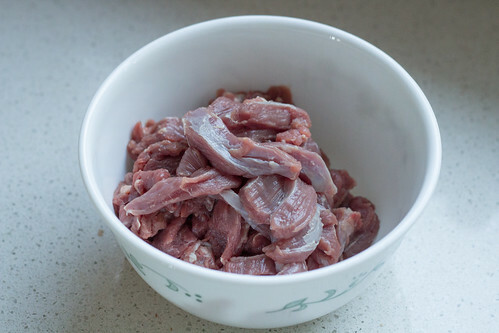 Note: Depending on the cut of beef you use, you may add the beef now if it requires longer cooking time or if you are using beef slices you can add these towards the end. 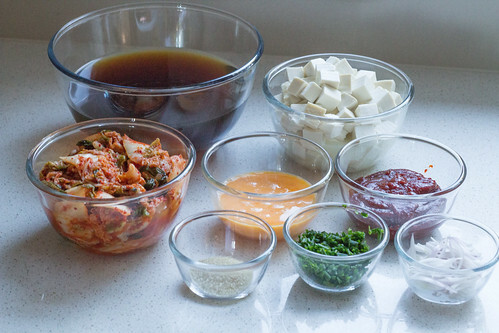 Salt is optional if already adding kimchi that has salt in it. 4. 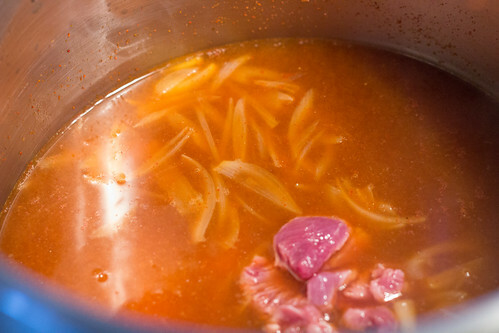 Lower the heat to medium, add in the kimchi and beef and leave to simmer for around 20 minutes to allow the beef and kimchi flavour to infuse in the soup base. 5. Before serving, add in the diced tofu and eggs and stir. Add in most of the chives to the pot, you can also sprinkle a small amount of chives into individual soup bowls as well. 6. Serve as is, or with a bowl of rice. 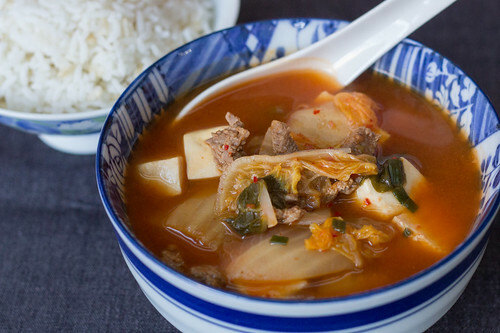 For a cold winter's day, this Korean soup will warm you right up. 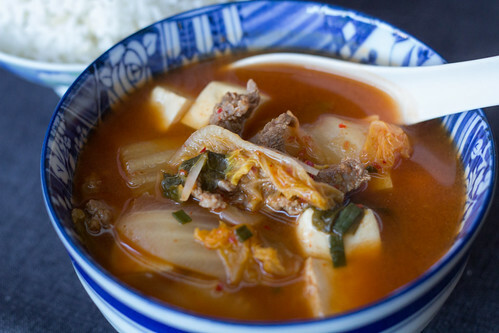 The subtle peppery flavour adds depth to the soup, and the kimchi provides just the right sour and salt flavour. Switch it up by adding seafood and fish stock! Pour the beef stock and water into a large/high saucepan or pot and bring to boil on medium to high heat. Add in the pepper paste and stir in until all the paste has dissolved into the liquid. Add in the shallots, salt and sugar and stir until sugar and salt have dissolved. Note: Depending on the cut of beef you use, you may add the beef now if it requires longer cooking time or if you are using beef slices you can add these towards the end. 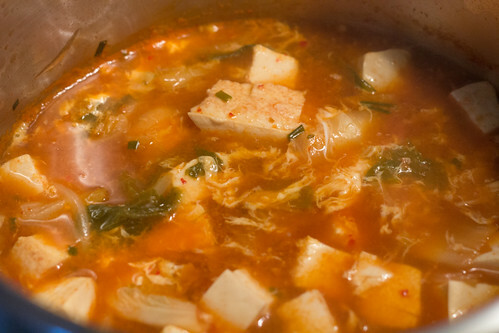 Salt is optional if already adding kimchi that has salt in it. 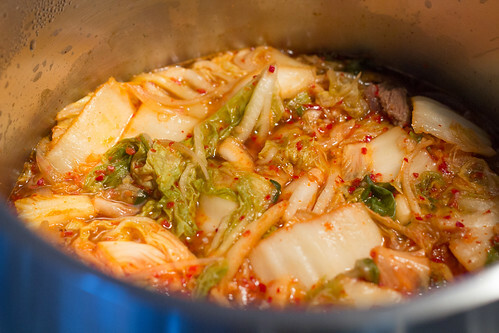 Lower the heat to medium, add in the kimchi and beef and leave to simmer for around 20 minutes to allow the beef and kimchi flavour to infuse in the soup base. Before serving, add in the diced tofu and eggs and stir. Add in most of the chives to the pot, you can also sprinkle a small amount of chives into individual soup bowls as well. Serve as is, or with a bowl of rice. To switch things up, you can leave out the Kimchi. Add 1/2 tbsp of salt to bring out the flavour of the beef. You can also change the seafood, to a marinara mix or prawns and scallops. You may also want to change the beef stock to a seafood/fish stock as well. We actually stumbled upon Pocha Restaurant as we initially wanted to dine at the Thai restaurant next door but being such a petite space, it was unfortunately full. Luckily enough we looked next door and saw this Korean restaurant opened. From the outside, Pocha didn’t really seem open. It was very dark inside, and no signs it was open. Somehow being desperate for some place to dine we walked in and found this very interesting restaurant. There is a long walkway with each side having this little covered/tent-like dining spaces. It looked like you were in some sort of food market and these were the outside tents to eat in, but somewhat private. The menu was slightly on the pricer side of things, and we didn’t really know what to order. We ended up ordering meal combo, choosing from the four dishes (you can select two). 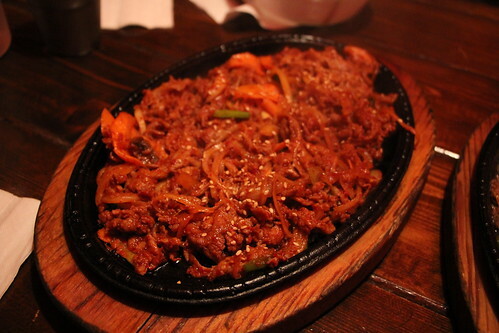 We ordered the spicy pork bulgogi (pictured above). Lovely flavours, subtle spiciness and a tad sweet marinated pork cooked with onions and carrots. Although, it was on the oilier side of things. It was very tasty. The other beef dish was also nicely cooked, and again with onions and carrots. Meat just cooked right but I preferred if they used less sugar on the sauce/marinade. Not too exciting but it’s still satisfying. The tofu soup was very light in flavour or seasoning but with the more robust flavours from the two meat dishes I think it complements each other well. It also comes with a salad that is dressed with a vinaigrette. 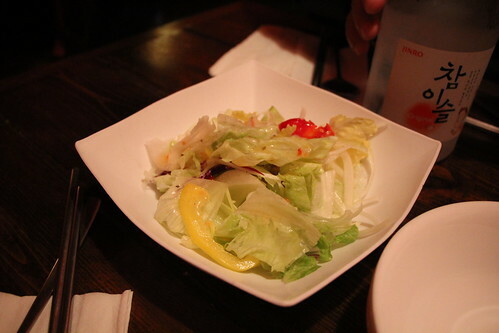 Very strong dressing and with the lettuce in large chunks, it was more difficult to eat. I would have liked the Korean/Japanese sesame seed dressing that is creamier and light brown in colour. 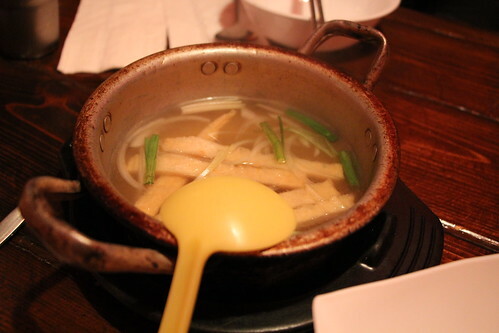 Overall, I didn’t mind Pocha Restaurant. It’s not the best Korean food I’ve tried but not the worst. The quaint dining atmosphere is certainly a plus, along with the food. Good service too on that quiet Tuesday night. Le Lapin Saute is this little cafe/restaurant/brunch eatery on rue du Petit-Champlain just on the outskirts of the inner walls of Old Quebec City. They seem to specialise in Rabbit cuisine which I’ve never really tried previously so it made it all the more tempting to try. We ate here for breakfast/almost lunch and it’s a very cute homely shop on this small but bustling street. 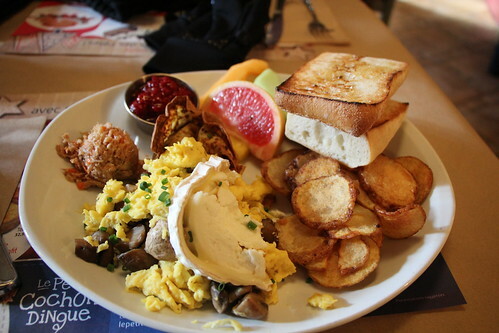 I ordered a rabbit dish (of course) that comes with scrambled eggs, rabbit rillette, crisp potato slices, cheese, mushrooms, bread, homemade jam and fruit. This was a large dish, probably best shared between two. The rabbit has a light texture, and similar to a pate, it’s wonderfully soft and shredded very thinly. A delight to eat, and probably not very good for you. The scrambled eggs were also light and just cooked to perfection, buttery and simply how it should be. The hard cheese melts ever so slightly against the just cooked eggs, but still retains its shape, and eating those crunchy chips as well. Wonderful. My first experience trying rabbit and rilletes and it leaves a positive impression. 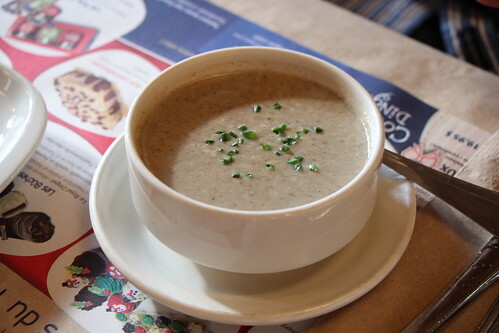 The mushroom soup here is also packed full of flavour (I think this was the soup of the day), creamy and fantastic on a nice cold winters day. Not too creamy though as some soups can be. Really tasty. 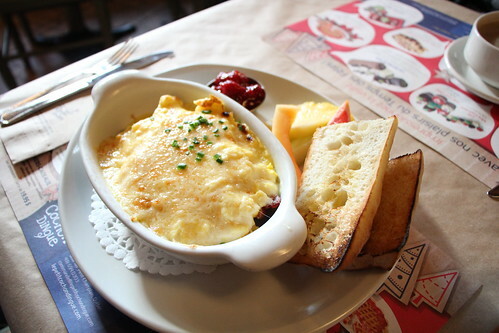 This cheesy little thing is their Casserole au Gratin with scrambled eggs, rabbit, bacon, onions confit, potatoes, hollandaise sauce, and of course cheese. I loved this, just out of the oven nice and warm. Perfect for winter, and absolutely satisfying. Le Lapin Saute is simply a gem in Old Quebec. I’d put this as a must visit during your stay there. Rabbit as its specialty but everything else is just wonderfully delicious as well. I can’t recommend it enough for a Canadian-French meal.